Hong Kong, October 8, 2014 – QIMA, a leading quality control service provider that partners with brands, retailers and importers around the world to secure, manage and optimize their supply chain, today announces its 2014 Q4 Barometer, a quarterly synopsis on outsourced manufacturing and the quality control services industry. 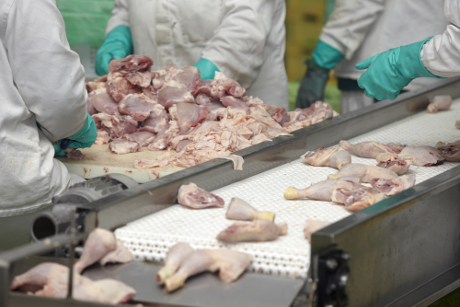 This risk is translating to increased orders for food inspections, which jumped 21.3% vs. the previous quarter and 30% year over year according to AsiaFoodInspection data, QIMA's food quality control services arm. AFI figures show that 51.7% of food inspections conducted between Q1 and Q3 2014 in mainland China have failed. China has responded to the September launch of India’s ‘Make in India’ campaign with a government backed ‘Made in China’ campaign. India’s campaign, which seeks to boost high tech manufacturing, has not offered specifics on incentives. The Chinese campaign is offering tax breaks to manufacturing companies to upgrade their machinery, in addition to tax reductions on imports of high tech equipment for key industries such as electronics. China's electronics manufacturing sector is mature but standards are mixed, with QIMA data showing that in Q3 2014, 24.5% of electronics inspections were beyond AQL (Acceptable Quality Level), an increase of 9.1% in quality levels compared to same quarter last year, but comparable to India, at 27.8%. 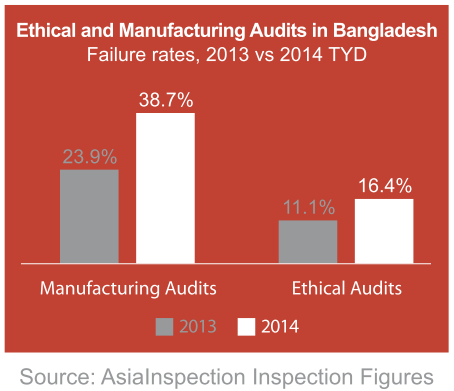 Ethical audits conducted by QIMA in China have had a 26.4% critical failure rate so far this year, an increase from 22.9% in 2013. That figure is close to India at 28.6%. QIMA data shows that Hygiene, Health and Safety, followed by Working Hours, Wages and Benefits, are the most common causes for failure of ethical audits in China. 1. Forbes. Queasy Reading: Shanghai Gov't Shuts Down McDonald's, KFC Meat Supplier. July 21st, 2014. 2. Reuters. China police seize 30,000 tonnes of tainted chicken feet. August 26th, 2014. 3. China Daily. Police bust gang selling toxic gelatin pill capsules. September 4th, 2014. 4. China Law Insight. Revised Amendment to the PRC Food Safety Law. July 28th, 2014. 5. Lexology. Harsher personal and corporate penalties for work safety accidents in China. September 12th, 2014. 6. Myanmar Business Today. MGMA to Provide Jobs for 30,000 Garment Workers. September 16th, 2014. 7. Yahoo News. Garment industry says 200 plants shut since Bangladesh disaster. September 11th, 2014. 8. Fibre2Fashion. Bangladesh global apparel export share to go up 1% by 2020. September 22nd, 2014.